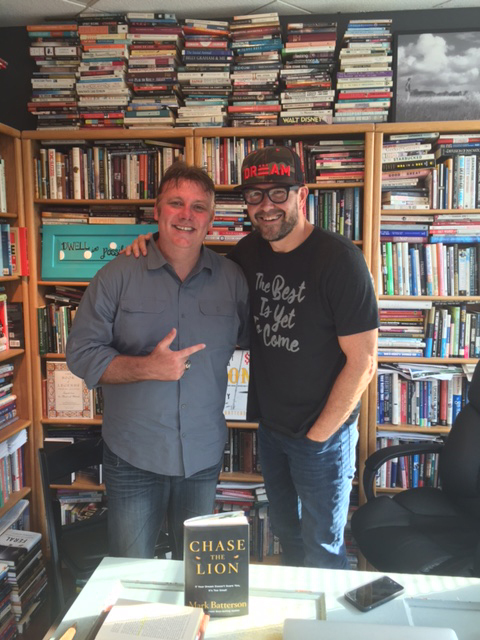 One of America’s most respected pastors and prolific authors, Mark Batterson has a brand new book out – “CHASE THE LION.” Mark and I have been friends for probably a decade now and we both share a passion for God and Country and love Capitol Hill and those who reside and work there. He didn’t have to ask me twice and seeing him alone is icing to my cake. We made a impromptu video talking about life, living for the Lord, leadership and leaving a legacy. Every time I read something from him or correspond I learn something. Yes, he is a NY Times Best Selling author and phenomenal preacher but he simply loves God and people. He is a gifted leader because he is a ferocious reader. You cannot LEAD if you never READ. One step further – I have said for years we cannot make a difference in the WORLD if we don’t spend time in the WORD! Pastors listen to pastors and we are all wise when we listen to the wisdom of others. I pray that this recent time together will enable you to glean some insights that you will benefit you in the days ahead. A “cup of Joe” is one thing but a cup of Mark is over the top! Enjoy!! Boy…. You get around. Is there any one you don’t know??? 😃👍🏾 Frank, when you coming back to preach in FL?